A career cybercriminal has been handed a sentence of 20 years for the first known instance of what is being described as an armed "domain hijacking" where he attempted to take control of a website.. at gunpoint. That's right, rather than using the conventional way of hacking a website, this cyber thief opted to use actual physical force to obtain control of the site. 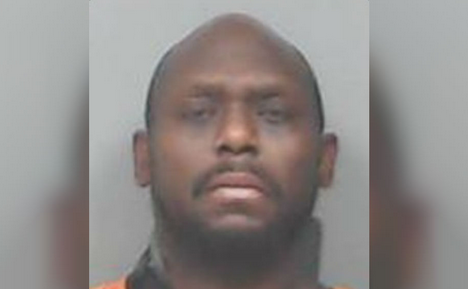 43-year-old Sherman Hopkins Jr. broke into the apartment of an online entrepreneur in Cedar Rapids, Iowa. Hopkins Jr. donned a pantyhose mask, dark sunglasses, and a stolen handgun to coerce 26-year-old Ethan Deyo to relinquish ownership of his website. The cybercriminal demanded that Deyo log into his computer and transfer ownership of the internet domain name DoItForState.com from Deyo's possession to another account. Hopkins Jr. also brandished a taser and pistol-whipped Deyo repeatedly in an attempt to get him to transfer ownership of the domain. In a struggle for the gun, Deyo was shot in the leg before turning the gun on Hopkins and firing multiple shots into his chest before calling the police. Hopkins Jr. survived the strong-arm robbery gone wrong which took place on June 21, 2017. He pleaded guilty to one count of "interference and attempted interference with commerce by threats and violence". Hopkins Jr. then took a plea deal with prosecutors since he had previously been charged with more serious crimes including kidnapping and use of a firearm during a violent crime. DoItForState.com was inactive for a month before Hopkins Jr. attempted to hijack it. The website was created for University of Iowa students as a forum for posting images of parties and wild antics. The site described itself saying, "College stories, College Life, College Snaps" before it was taken down. Local police described the domain name as "valuable" and said Hopkins Jr. wanted it "transferred back" to a third party but it was not clear who that third party was. Hopkins Jr. initially broke into Deyo's home, who worked for a company that hosts domain names, but Deyo locked himself in a bedroom as the home invader broke down his door. The U.S. Attorney's Office in Iowa said in a criminal complaint, "Hopkins pulled out a piece of paper from his pocket, which contained a series of directions on how to change an internet domain name from one account to another account." "Hopkins put the firearm against the victim’s head and ordered him to follow the directions on the piece of paper. Hopkins also took the victim’s cell phone and threw it so that he could not call for help." Deyo asked Hopkins Jr. at this time for a postal address and phone number saying they were required to transfer ownership of the domain. Hopkins Jr. promptly replied by pistol whipping Deyo and then used a taser on him multiple times. "Hopkins then cocked the gun. Fearing for his life, the victim quickly turned to move the gun away from his head. The victim then managed to gain control of the gun, but during the struggle, he was shot in the leg," the complaint said. The crime of "domain hijacking" is when someone steals control of a website illegally, usually through hacking. This incident in Iowa is thought to be the first time the crime has been committed in person by an armed attacker. US District Senior Judge Linde Reade called Hopkins Jr.'s actions "brutal and senseless" at his sentencing. Judge Reade imposed a sentence of 20 years in prison on Hopkins Jr.